Throughout history there have been many thru hikers whose stories have come to be widely known in the Appalachian Trail community. There was Earl Shaffer who was the first thru hiker. Then Gene Espy who was the second. The self explanatory Barefoot Sisters, Lucy and Susan Letcher, are more recent additions. And of course there is Jennifer Pharr Davis and her record-breaking speed hike. But there is one more for the history books that stands out. Her name is Grandma Gatewood. A photo of Grandma Gatewood taken while on her thru hike. 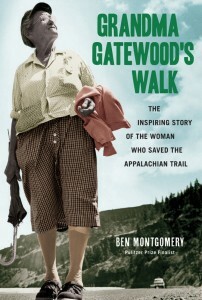 In his new novel released earlier this year entitled Grandma Gatewood’s Walk: The Inspiring Story of The Woman Who Saved The Appalachian Trail, Ben Montgomery goes into detail about the lady and the legend. Emma Rowena Gatewood, as she was born, was 67 when she set out on her thru hike on May 3rd, 1955 becoming the first woman to complete a solo thru hike of the Appalachian Trail . Several years before, she had read a National Geographic article describing the trail and depicting it as a pristine footpath along the backs of the Appalachian Mountains. Throughout the book. Montgomery stresses the deep love Grandma Gatewood felt for both the outdoors and walking, quoting her several times in regard to it being her favorite pastime and also largely the reason she was thru hiking. Grandma Gatewood was a pioneer of the ultra light backpacking movement long before it was actually fashionable. She set out on her journey with out a shelter, sleeping bag, maps, cook set or even a backpack as we know it today. Instead she carried a denim drawstring bag that she had hand stitched and inside it a shower curtain to keep off the water. Relying on rocks heated by the fire to warm her at night, she often foraged for food along the way to supplement her meager diet of dry goods. Little else was in her bag besides a coat, a tin of Band-Aids and a small journal. She went through a surprising amount of pairs of Keds on her journey, which started at Mt. Oglethorpe another 20 miles southwest of Springer Mountain. 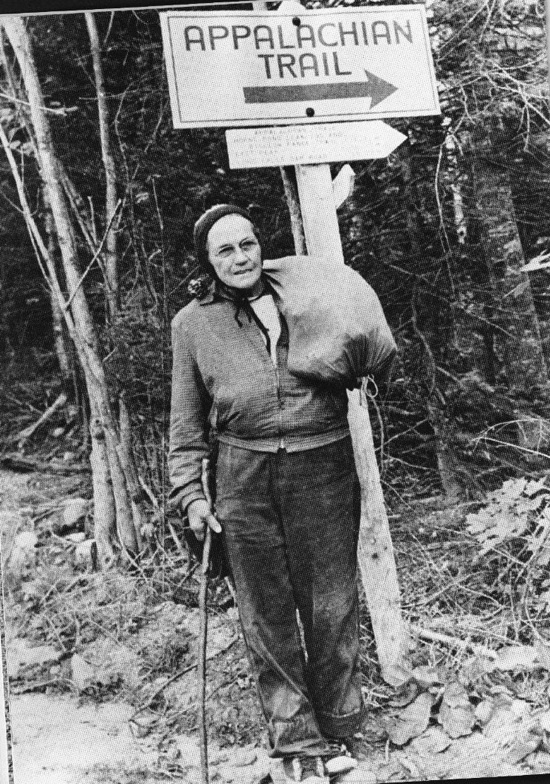 With her pack balanced over her shoulder and a skinny walking stick to brace her, Grandma Gatewood set out for the 2,050 mile trek to Katahdin. A hard farm life in Gallipolis, Ohio had prepared her for the rough ways of the wild. She was the grandmother to 25 children and had raised 11 children with a stubbornly abusive husband whom she often took refuge from in the woods. By the age of 67, standing at 5”2’ and weighing in at 150 pounds, Emma decided to head for the southern terminus of the Appalachian Trail with out even a note left for her then grown children. 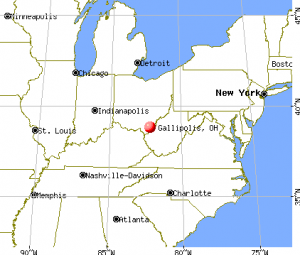 Gallipolis, Ohio is just on the other side of the Ohio River from West Virginia and only thee hours north of Bland, Virginia. Each time Montgomery asked one of Grandma Gatewood’s surviving children if they were ever worried about her, he always got the same response. They didn’t worry a bit. They knew their mother could take care of herself, even when she seemed to drop off the face of the planet. It wasn’t until she was nearly half way done hiking the trail that they actually learned of her whereabouts. Reporters had become a constant occurrence in her life as she walked through towns. One particular article out of Maryland reached all the way back home in Ohio and finally clued in her family about her journey. Montgomery’s background in writing for newspapers becomes apparent more than in the seamless storyline he creates of a thru hike nearing on sixty years in the past. He effortlessly sways back and forth between Emma’s thru hike and the history of her life leading up until that point. At times he uses the same skills needed in pouring over Gatewood’s journals and digging through old biographies and articles to also build an image of the time in which Emma Gatewood lived. The pages of the book some times read like a news paper themselves, spouting out intriguing historical facts that took place as Grandma Gatewood walked northward. 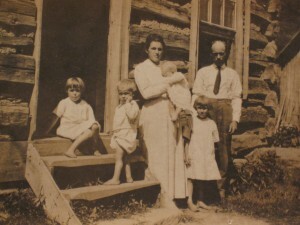 Grandma Gatewood with her Husband, P.C., and their four youngest children back when she was still known as Emma. Early on in his book Montgomery tells of the creation of the trail itself, as well as the interstate highway system that brought along a downturn in walking due to the growing popularity of the car. Later he traces back the first headwinds of the violent hurricane that lead many to wonder if ever there had been fouler weather recorded than in the summer of 1955, leaving Grandma Gatewood many tough fords in the northeast. Towards the end he speaks on pedestrianism and the sudden upturn in those who partake in it for sport and recreation. Montgomery goes on to list several other notable feats in walking but the most impressive one remains Grandma Gatewood. This is because her thru hike of 1955 was only the beginning. 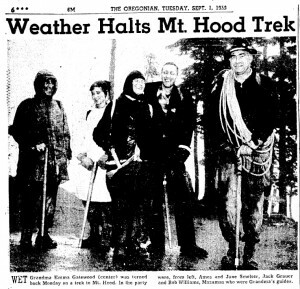 She conquered the trail again in 1957 and eventually pieced together a third completed hike in sections as well. In 1959 Grandma Gatewood set out for a different 2,000 mile long trek all together from Independence, Missouri to Portland Oregon known as the Oregon Trail. Whenever she was home in Ohio her feet were her main mode of transportation. Still, she got around the country quite a bit. Due to her fame she was gifted several open ended bus trips which she used to visit friends and family as well as to explore the nation. An Article from the Oregonian in 1959 about bad weather during Grandma Gatewood’s Oregon Trail hike. When she wasn’t on the move, Emma Gatewood was still a very industrious woman. She helped in blazing sections of the Buckeye Trail throughout Ohio and became such an avid supporter of one particular part of wilderness that a hike in her honor is still held every year to this day. For every thru hiker, as well as those very familiar with the Appalachian Trail, Grandma Gatewood’s Walk is an inspirational book down memory lane as you trace her accomplishments northward on the trail. It is an opportunity to see the Appalachian Trail in a light that has long since faded. To truly find that you have walked the same path as so many others over the decades brings a strong kinship to the trail. Though some of the ridges you traverse may change, the journey remains the same. In reading this book, I discovered that fifty-eight years after Grandma Gatewood’s own hike, I myself ran into the same small town of Salibury, Connecticut with the same desperate hope of finding bug spray to ward off the mosquitoes. Some things never change. Ben Montgomery’s book. Well worth the read!